Madame Tussauds New York has just unveiled their Captain Marvel wax statue and it's actually really well done. The figure looks an awful lot like Brie Larson and is light years better than their version of popstar Beyonce, which looks absolutely nothing like her. 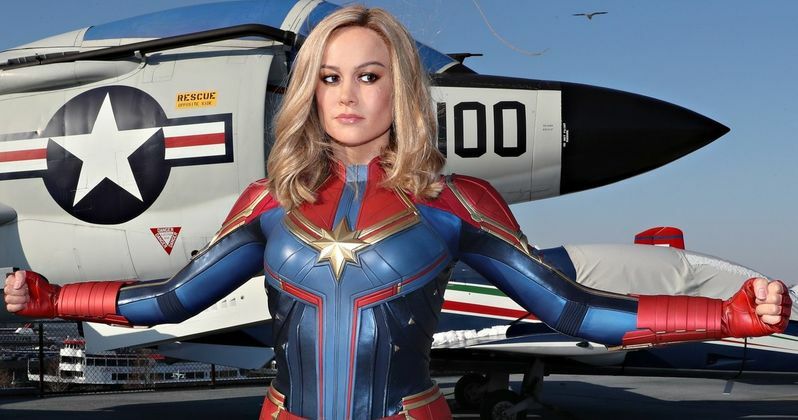 The Carol Danvers wax statue just landed over at Madame Tussauds after making her first public debut last Friday on the movie's release date and International Women's day at the Intrepid Sea, Air and Space Museum. Fans were taken aback at how well done the statue is. Visitors to Madame Tussauds New York can take flight with Captain Marvel as they soar through the skies in an interactive experience within the attraction's Marvel Super Hero Zone. Carol Danvers joins an already action-packed line-up of super heroes at Madame Tussauds New York that includes The Hulk, Thor, Captain America, Iron Man, Nick Fury, Spider-Man and many more. The Marvel Super Hero Zone also features a 4D film experience which brings in sights, smells, wind, water, and more, to give MCU fans an authentic and immersive experience. Captain Marvel debuted in theaters last week and it is tearing up the box office. The first female-led MCU project has earned over $550 million in just two weeks and it shows no signs of stopping any time soon. The Carol Danvers standalone movie has done a lot to raise Brie Larson's already huge profile. The Academy Award winning actress is currently in a whole new level of fame who also has the bragging rights of being the most powerful superhero in the entire MCU. Marvel Studios boss Kevin Feige has stated on more than one occasion that Captain Marvel will lead the future of the MCU after Avengers: Endgame closes out Phase 3 of the MCU. After watching Carol Danvers learn to harness her powers and ultimately break free from the chains that were binding her, MCU fans are really interested to see where the character goes next and to find out what a possible weakness is for the massively powerful character. As of now, it doesn't really look like she could be defeated by anything, not even Thanos and the Infinity Gauntlet. Speaking of Thanos and the Infinity Gauntlet, Captain Marvel was finally featured in the Avengers: Endgame promotional material this week in the latest trailer and the killer new poster. She is going to help Earth's Mightiest Heroes as they try to reverse Thanos' Decimation. It isn't clear how they're all going to go about this daunting task, but Carol Danvers is more than likely going to be a huge www.mmdst.component when the dust settles. While we wait for Endgame to hit theaters, there's plenty of time to go see Captain Marvel and then head over to Madame Tussauds to check out the excellent wax figure of Brie Larson's Carol Danvers.